China is launching its first domestically built research icebreaker, Xuelong 2, or Snow Dragon 2, on Monday, and plans to officially put it into service in the first half of 2019, according to its builder. 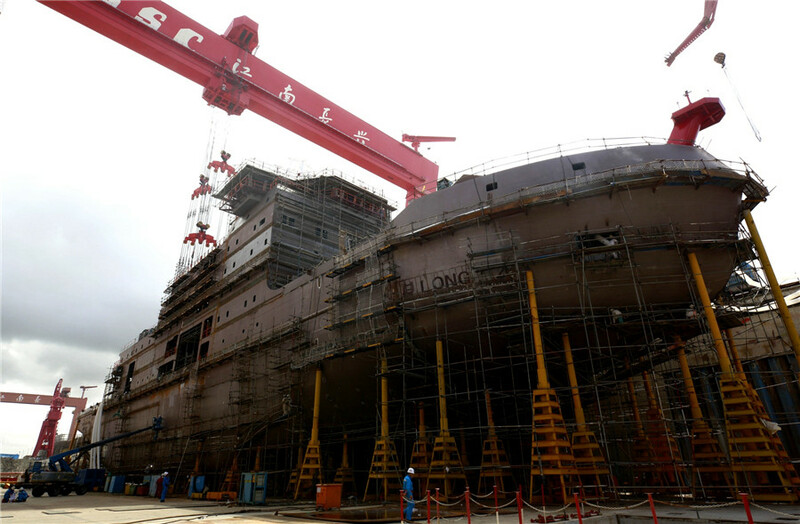 A launch ceremony for the vessel will take place at Jiangnan Shipyard Group in Shanghai, China State Shipbuilding Corp, parent of the shipyard, told China Daily. The launch means construction has basically been finished and it will soon initiate sea trials. After the ceremony, Xuelong 2 will conduct mooring tests and undergo additional equipment installation, and will formally begin operations in the first half of 2019 if everything goes according to schedule. Its service will extensively boost China's polar research and expedition capabilities, according to the State-owned shipbuilding giant. Construction of Xuelong 2 began in December 2016. The vessel is 122.5-meter long, 22.3-meter wide, and has a displacement of 13,990 metric tons. With a maximum speed of 15 knots, or 27.8 kilometers per hour, the icebreaker can sail on 60-day expeditions with 90 crew members and researchers, said China State Shipbuilding Corp. It will be equipped with advanced oceanographic survey and monitoring apparatus, enabling experts to carry out research into polar ice coverage, atmospheric and environmental conditions, as well as conduct seafloor and biological resource surveys, the company added. Wu Gang, chief designer of the icebreaker at the company's Marine Design and Research Institute in Shanghai, said the vessel is designed to break 1.5-meter-thick ice at speeds of 2 to 3 knots, and can operate in temperatures as low as-30 C.
He said the vessel will enjoy good maneuverability and adhere to strict environmental protection standards. Chinese scientists have begun design work on a next-generation icebreaker that will be more advanced than Xuelong 2, Wu added. 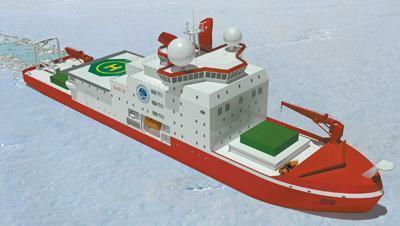 The designer explained that the next-generation icebreaker will be able to break ice about 3 meters thick and endure temperatures as low as-45 C.
China now operates a single icebreaker, Xuelong, which was designed for cargo transportation rather than scientific research operations when it was built in Ukraine in 1993. The ship was purchased by China and converted to a polar research and resupply vessel. It has carried out dozens of scientific expeditions to the Arctic and Antarctic. The nation has been paying more attention to scientific research and peaceful development in polar regions. It has conducted 34 Antarctic expeditions and eight Arctic expeditions.